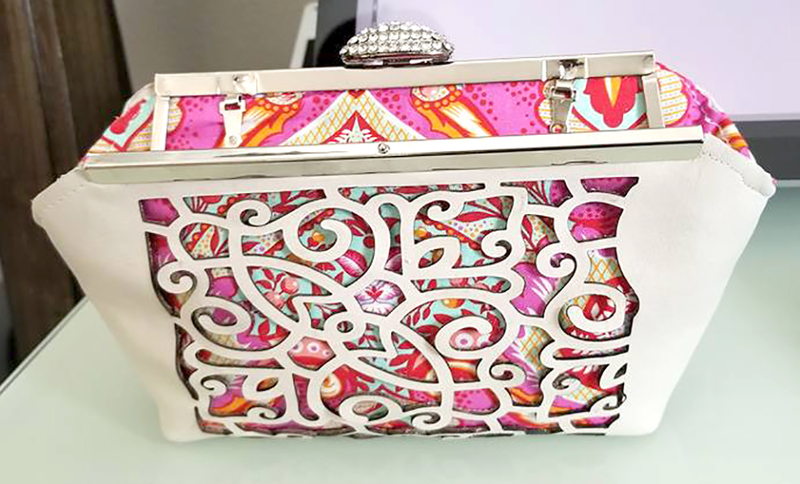 Laser cut leather provides the unique pattern on handbags and clutches of all sizes. The interior fabric can be customized to whatever the customer wants. Once Robin Grogan got her hands on a fancy laser that she could use to cut letters and designs into glass and wood, her imagination took off. She started out with the idea of personalizing wedding photos with special frames featuring custom dates and addresses. “As we started doing that, we started learning all the different things we could do with a laser cut — custom glasseware and jewelry with GPS coordinates to help people capture those special times and moments in their lives,” Grogan recalled. Then she and her husband Roy Castell learned about the Airstream camper at Winthrop Town Center. “The Airstream gave it all a more fun artsy feel,” she said. 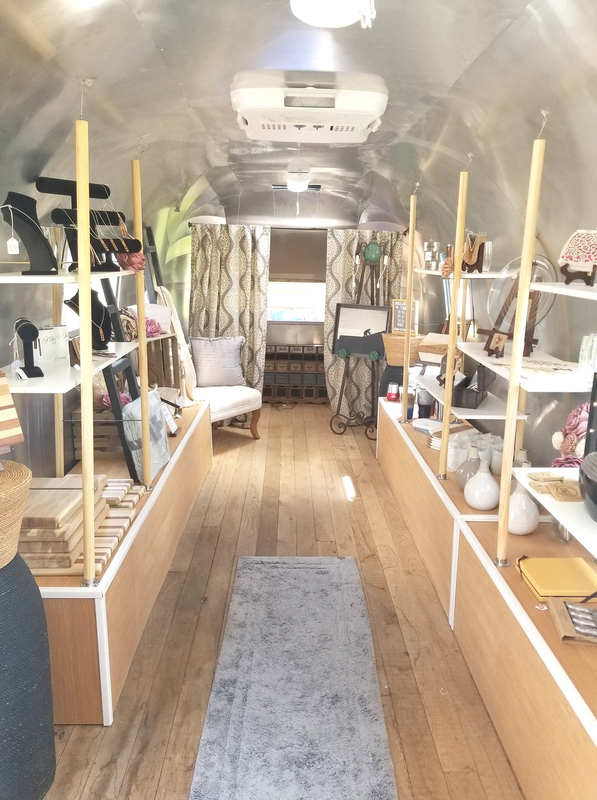 Today, the first of an expected four or five Airstream campers coming to Winthrop is open as Robin Nest, a gift shop featuring a multitude of custom handbags, jewelry, glassware and more. “We call it an Airstream boutique,” said Castell, who noted that both he and Grogan have fulltime jobs, so the Airstream is open evenings and Saturdays. Robin Nest is a new gift studio located inside an Airstream trailer at Winthrop Town Center, located at the southeast corner of Bloomingdale Avenue and Providence Road. 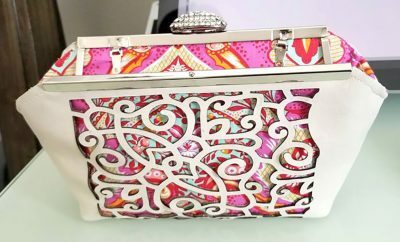 Among the offerings are custom leather handbags that can be fitted with any color interior, laser-cut glassware, custom frames and coasters and more. Photos from Robin Nest. She’ll cut a design in leather using the laser and use the leather as the bag’s frame, lining it with any color interior. They run in all sizes from clutches to large purses. She said she is working to take that laser to a level most people never go. “We sell glasses and such, but with the handbags, it is something you don’t see anywhere else. “It’s only limited to Robin’s creativity,” Castell said. The Airstream boutique opened Aug. 4 and had its official ribbon-cutting with the Greater Riverview Chamber of Commerce in early October. Business has started off with numerous corporate clients ordering custom leather coasters for their customers, along with glassware they can use as promotional gifts. And Robin Nest has gotten orders for laser-cut wooden coasters for some local restaurants. They are also selling the plates with wedding vows etched into them and other items. Castell said they are working to build up the retail side of the business. Castell said they welcome the Riverview community to visit Robin Nest and have a look at the custom giftware it offers. Their merchandise is also available online. The Airstream is located near the arts center at Winthrop, at the southeast corner of Bloomingdale Avenue and Providence Road. “The community here has been absolutely incredible, anything from neighbors calling us on the Nextdoor app and promoting our shop to offering gifts for our ribbon-cutting,” Grogan said. Mostly, Castell said, Robin Nest is a great creative outlet for Grogan, who has always been into art. The shop is open Monday, Wednesday and Friday from 5 to 8 p.m. and Saturday 9 a.m. to 5 p.m. Other times are available by appointment.